It hot hot hot over here. I just want to keep away from cooking as much as I can. 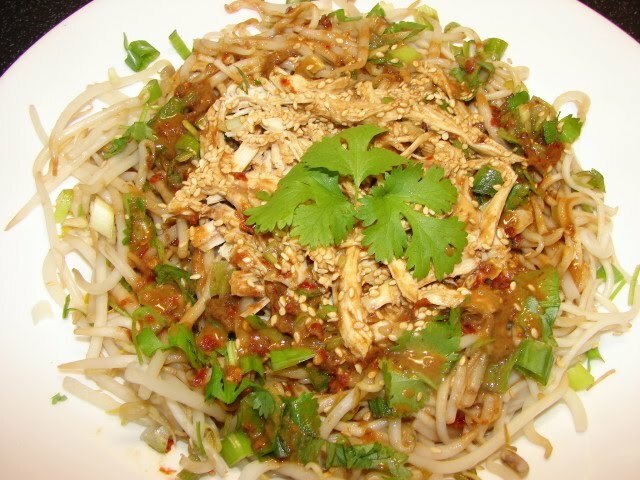 Cold noodles is something which is quite appetising in this warm weather. Cold noodles with sesame dressing 'ma jiang ren mian' 麻醬冷麵 is common in northern part of China as a snack for the warm summer. This cold dressed noodles can be plain (vegetarian) with a bit of vegetables like bean sprouts and/or cucumber. For meat eaters add some precooked/cold shredded meat (any type), boiled, steamed or roasted. I have a cold roasted chicken and some chicken jelly from the chicken juice collected during roasting, so ideal to make up some cold noodles. The sesame paste dressing is a classic Sichuanese/ Beijingnese style. The good thing with cold noodles is it can be made in advance eaten at room temperature or eaten cold after cooling in the fridge. Minimum cooking is required. Noodles: Any kind of dried noodles or homemade rustic noodles. Cooked then cooled with room temperature/ice cold water. Mix with a little plain cooking oil or sesame oil if you are not going to eat right away, so the noodles will not stick together. Garnish: Chopped spring onion, chopped coriander (cilantro) and roasted sesame seeds. 2 - 3 tbsp of fairly concentrated stock (vegetarian) or meat juice/jelly/stock (like chicken or others) or some of this Knorr real stock in a tiny tub. For this recipe I used the chicken stock jelly collected when roasting the chicken. How I make this jelly is put about 1.5 cup of water in the roasting tin, put the chicken on top on a rack. Let the chicken juice drip on the the water. When the chicken is done, the water is reduced and leaving a concentrated chicken stock. Put the juice into container, chill and remove the fat on top. a little toasted sesame oil or oil floating on the jar of sesame paste. * If you like garlicy flavour you can add some grated/finely chopped garlic, I find garlic overpowered the flavour of nutty sesame. Warm the thick sesame paste in the microwave for few seconds till softened or stirred briskly till mixable. Warm the stock if it is in jelly form to dissolve. Then mix all the ingredients together, taste and add more of any if required to your own taste. Put the noodles onto individual deep dish or pasta bowl. Pile on chosen vegetables and meat. 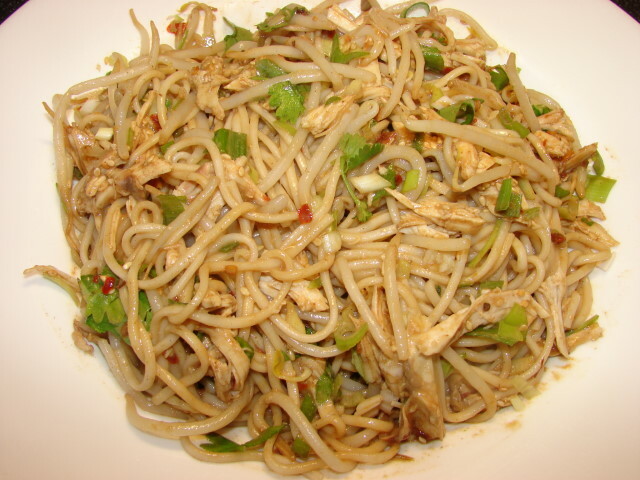 Yummy, I made a cold chicken & noodle salad recently which is not too different from your recipe. Excellent and very flavoursome chicken noodles. Would you recommend using black or brown sesame paste for this recipe? Either or mixed. The one I bought as shown with this post has both white and black. If you are making it yourself it is easier to use white or mixed. If using all black you don't know if the seeds are under roasted or burnt. The seeds needs to be dry roasted quite brown before blending to paste.